Jurassic World: the Fallen Kingdom will hit the big screen in June, and a new video game – Jurassic World Evolution – will be released to coincide with it. While there have been other Jurassic Park business simulation/tycoon video games before, Jurassic World Evolution looks set to be the biggest, toothiest of them all. The Jurassic Park / World concept lends itself to a tycoon game beautifully. There have been action titles based on the franchise before, but it’s the responsibility of actually running the park and handling the inevitable emergencies that captures the movies’ flavor. You get to charge people extortionate amounts of money, bombard them with souvenirs and refreshments, and watch in delight as they flee from rampaging beasts – what’s not to love? Still, while Jurassic Park: Operation Genesis had some real strengths and the Jurassic Park Builder mobile game worked well enough, Jurassic Park Evolution should be the video game fans have been waiting for. The Jurassic Park universe is as popular as it ever was, 25 years after the first movie became a phenomenon and gave the ever-lovable Jeff Goldblum one of his most iconic roles. Mr. Goldblum returns in Jurassic World: Fallen Kingdom, of course, bringing Dr. Ian Malcolm back to the franchise after his lead part in The Lost World. However, he’s lending his vocal talents to Jurassic World Evolution too – something that will satisfy both fans of the series and the man himself alike. Dr. Ian Malcolm will serve as the game’s narrator, serving as a voice of experience, conscience, and authority throughout in a way only Jeff Goldblum can. This should help to steep Jurassic Park Evolution in the universe and add to the overall atmosphere. At the very least, it does help to make the experience a little more memorable, having a recognizable voice narrating the action at times. Remember how cool it was to hear Bruce Campbell’s dulcet tones during the games based on Sam Raimi’s Spider-Man movies? Concerning settings, the game takes place on Isla Nublar (as seen in Jurassic Park and Jurassic World) and the surrounding islands, including Isla Matanceros and Isla Muerta. There are five in total, and the overall goal of the game is to create and maintain successful parks on every single one. That’s a pretty tall order, considering the sheer amount of work and room for error there is in keeping dozens of dinosaurs fed, healthy, and happy (not to mention preventing breakouts). Throughout Jurassic World Evolution, you will need to pay attention to your unique park’s security, science, and entertainment interests. Different advisors will present you with goals to achieve, which ties into the overall story running through the game. You will need to manage the various aspects of your park to make sure you are providing the proper level of care for the dinosaurs, offering visitors all the facilities they need, and generating enough revenue to stay in business. As you keep improving one park, you will eventually unlock another, and another, until you’re set up across all five islands. 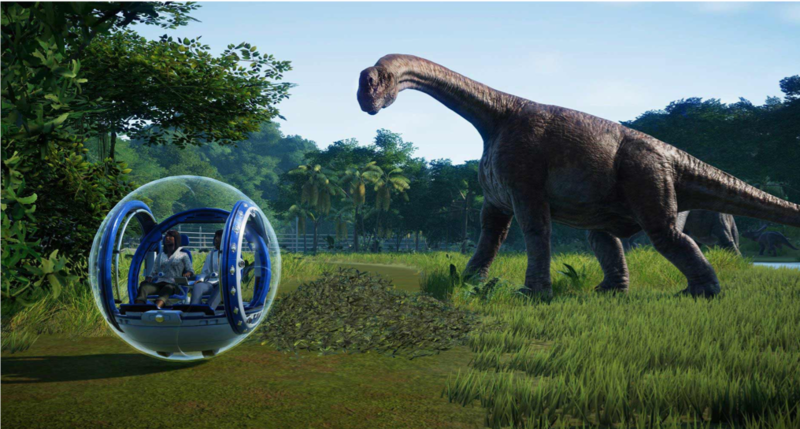 The dinosaurs themselves are designed to react and behave in authentic ways, with more than 40 different species available at Jurassic World Evolution’s launch. Brachiosaurus, Ankylosaurus, Ceratosaurus, Edmontosaurus, Pachycephalosaurus, and more all showcase the diversity in the species, each possessing their genetic traits and behaviors. You will get to unlock new dinosaurs through DNA sequencing, using materials found at dig sites, while genes can be tweaked to change species’ looks and behavior. 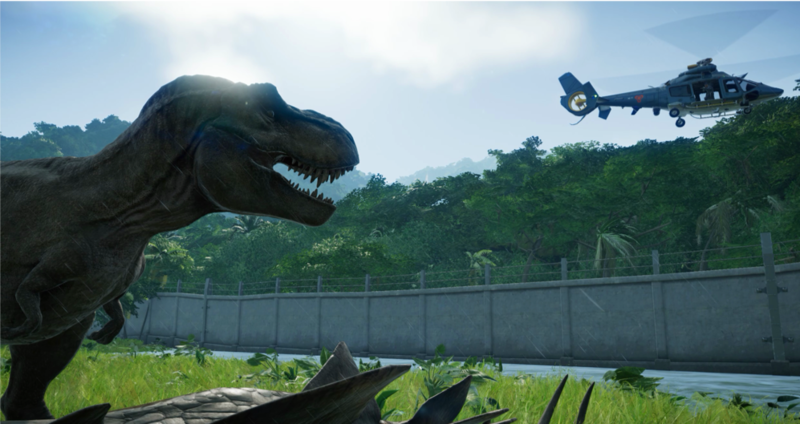 This taps into the core ideas at the heart of the Jurassic Park franchise and Frontier Developments have taken care to make sure that only certain types of hybrids can be created, stay true to some sense of authenticity. Each player may end up with slightly different dinosaurs in their park, and their varied needs must be catered to. Environmental elements – ground levels, trees, water – can all be manipulated, to create the most suitable terrain for your park and its creatures. 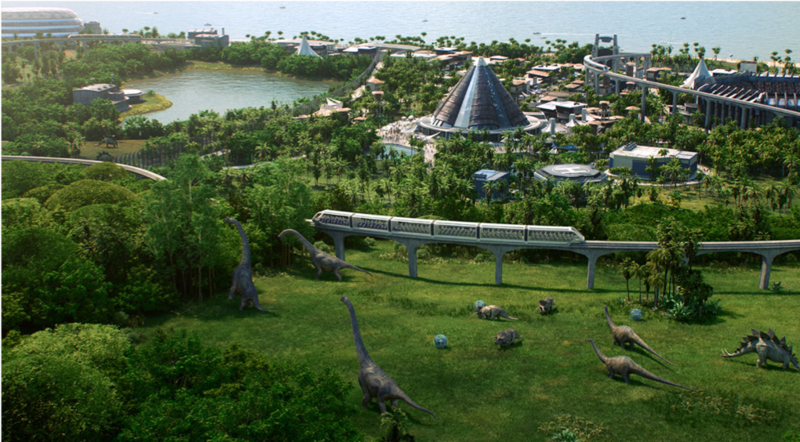 You will need to build critical facilities around the sites too, including rides, transport, shops, eateries, and other must-haves, including recognizable vehicles from the films. Certain aspects of running the park, such as ongoing building and incubating dinosaurs, will be some of the most expensive, and players who don’t pay attention to their management skills could end up having to close. Of course, Jurassic World Evolution just wouldn’t feel complete if extreme weather, power cuts, and rampaging dinosaurs didn’t show up from time to time. Proper security, fences, enclosures, ranger stations, and more are all vital to handle challenges. Trucks and helicopters can be controlled, and you’re free to step into the shoes of individual workers to perform critical tasks around the park too. Frontier are focused on making Jurassic World Evolution a deep, immersive game that captures the look, feel, and lore of the franchise. The inclusion of a narrative, genetic sequencing, multiple islands, and (of course) Jeff Goldblum all indicate a package that should satisfy fans. Developers Frontier Developments know a thing or two about tycoon games and animal-related management sims too, having worked on several RollerCoaster Tycoon titles, Wallace & Gromit in Project Zoo, Thrillville, Zoo Tycoon, and Planet Coaster. Could it be the best Jurassic Park video game ever made? It’s possible – and we only have to wait until June 12th to find out. Jurassic World Evolution will be available on PS4, Xbox One, and PC. 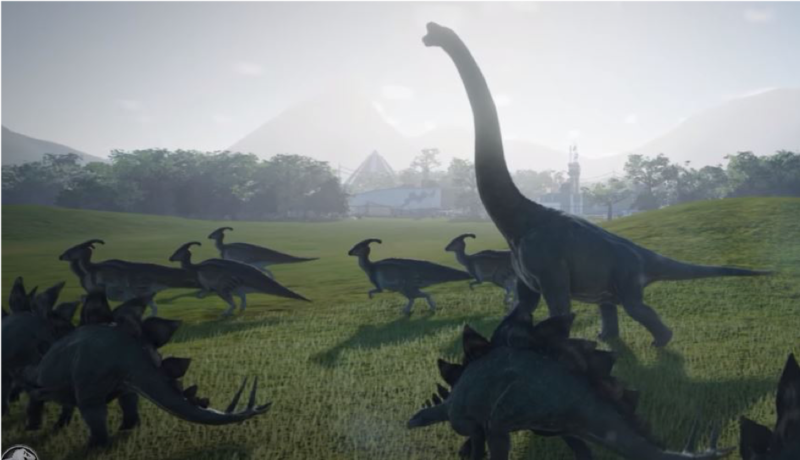 Jurassic World Evolution will provide you the chance to build your dinosaur park when it’s released in June, and it’s shaping up to be one of the best Jurassic Park games so far! Are you excited to play it? Let us know!